A unique neoprene hand mitt allows users to comfortably hold the iPad while in the case and reorient the iPad. No matter how you spin it, this case is the ultimate in functionality for Apple iPad users. 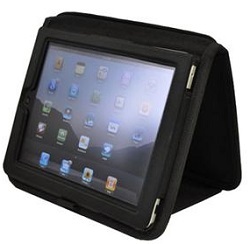 The iPad stays protected from bumps and scratches in this durable 1050D ballistic nylon and neoprene shell. A unique neoprene hand mitt allows users to comfortably hold the iPad while in the case and reorient the iPad for presentations and signature collections, simply by spinning the case while on the hand. The iPad can be used in all orientations with this unique, functional design. Get laptop functionality from your iPad 2, 3 & 4 with the CODi Bluetooth Keyboard case. Comfortably use your iPad in your classroom, dorm or office and adjust it to any viewing angle. Just clip it! The Macally CLIPMOUNT is the ideal iPad/iPhone holder for any desk or table.